The program will be at 7:30 p.m. Saturday and 3 p.m. Sunday in the Belushi Auditorium in the McAninch Arts Center at the College of DuPage in Glen Ellyn, and is directed by “Captain” Kirk Muspratt. A “Cookies with Kirk” reception follows. Composer Gustav Holst wrote “The Planets” in 1914. It’s an enduringly popular suite that names each movement after a planet in the solar system and its corresponding astrological character (For example, “Mercury, the Winged Messenger”). 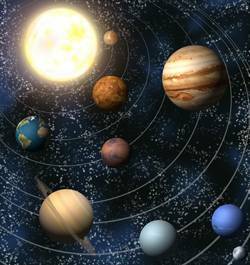 Earth and Pluto are not represented, as Pluto wasn’t discovered until 1930. Of course, we all know how that worked out for Pluto (demoted to “dwarf planet” in 2006). Around 2006, Jose Francisco Salgado created a series of short films to match each movement of the suite. Salgado is a doctor of astronomy, visual artist, photographer and co-founder and executive director of KV265, a nonprofit science and arts education organization. This weekend, the NPO will perform “The Planets” while Salgado’s films are shown. During the first half of the concert, it will just be Muspratt and a big screen on stage. He will talk to the audience while a short film clip about each of the seven planets/seven movements plays. He’ll talk about the music, giving the audience the composer’s eye view of what’s going on in the suite. Salgado regularly collaborates with orchestras, composers and musicians. His Science and Symphony films have been presented in 15 countries. The premiere of this project was in 2006 with the Chicago Sinfonietta, which he still works with closely. Muspratt had friends who saw the KV265 production at Millennium Park, and told him he needed to see it and even set up a meeting with Salgado. “They’ve done the show with the Boston Pops, the San Francisco Symphony — it’s been very successful all over North America,” he said. Very simply put, it’s an evening of music and astronomy. “I’m going to take the piece apart on the first half of the concert … what makes up each piece musically, how Holst orchestrated it, how unusual it is, how many tympani are used … it starts with two sets of tympani playing in 5/4. Where else do we have something like that in 1913? It’s very unusual. The whole piece in the time of 5/4. It makes it all off-balance and edgy and warlike, menacing and dangerous-sounding,” Muspratt said. Although astronomy has never been a passion of Muspratt’s, he recognizes that a lot of people love to study space and the heavens. People know more about space than at any other time in history because of the advances in science and astronomy, he said. The second part of the concert is a “big, 50-minute, gorgeous film, almost like the big, BBC ‘Earth’ ones while the orchestra plays,” he said. “My intention was to make something where the music and the film reinforce each other,” Salgado said. He was toying with the idea of using “The Planets” by Holst since he was a teenager (“The Planets” was the second classical CD he purchased, after Mozart), but it wasn’t until 2005 when the Sinfonietta asked him to come up with a visual backdrop for concert. “It was very pleasant to go to the concert hall and listen to Holst’s music and see a slide show of very pretty pictures of the planets. That’s a nice concept, but I went much further than that,” he said. “I wanted to make a film. I took that as a challenge … to make a film that would follow very closely the character of the music as well as the tempo. That was the beginning of the Science and Symphony film series.” Muspratt hopes he gets a lot of questions at intermission — people fill out “Ask Kirk” cards so he can educate the audience about what’s going on. He thinks this one will inspire a lot of questions. “It’s a very fun concert. The music is astonishing and powerful,” Muspratt said.